Dodge City’s Cathedral of Our Lady of Guadalupe is a stunning architectural achievement that embodies the classic disparity between traditional and contemporary worship. With its soaring ceilings and open, 270-degree seating, this 1400-seat sanctuary creates a wonderfully reverberant sense of musical majesty, but at the expense of the intelligibility needed to deliver the message. To address these issues in the 12 year-old building, Amos Yost of Montezuma, KS-based Montezuma Sound was contracted to design and install a new sound system. His solution for creating clear intelligibility amid the room’s glorious reverb was centered on the IC Live digitally steerable array system by Renkus-Heinz. As Yost explains, the room’s circular design and abundance of hard, reflective surfaces presented a number of challenges, and the existing distributed PA’s speakers were aimed almost straight down at the tile floor, creating uncontrolled reflections that exacerbated the room’s ringing 3.5-second reverberation time. “The organ and choir music sounded pretty good, but voice intelligibility was sorely lacking,” notes Yost. 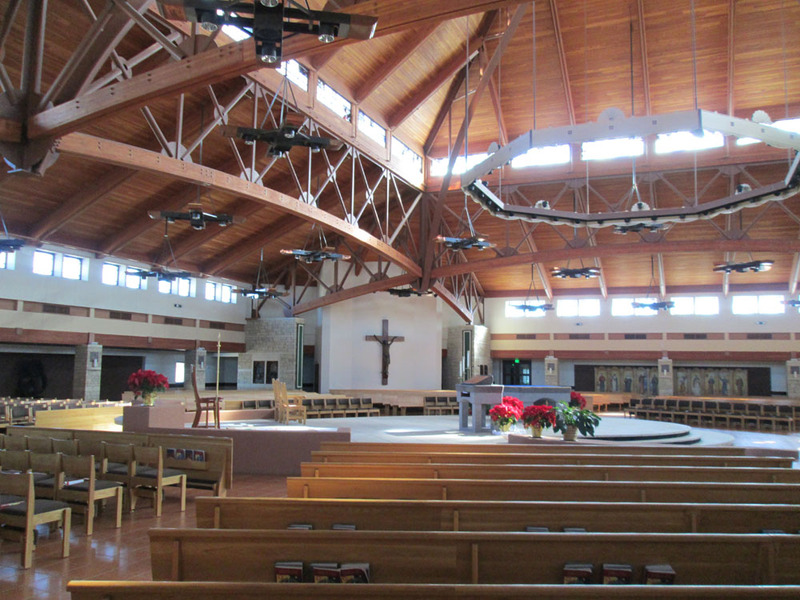 It was clear that a steerable array system would directly address the room’s issues, but because the sanctuary is a circular space, effective deployment would be tricky. Montezuma Sound’s solution was to set up two ICL-FR-DUAL columnar arrays mounted on the walls behind the altar area, cross-firing to cover the 270 degree seating spread while preserving audience sightlines. This arrangement created smooth, even coverage from the first row to the last, a throw of 120 feet. With twin IC Live columns of 16 speakers each, there was more than enough beam steering flexibility to cover all seating, even those under the balcony, while avoiding unwanted reflections from the windows, side walls, and balcony facing. Our Lady of Guadalupe features two Catholic services each Sunday. The traditional service is in English and features pipe organ and choir. The second mass is offered in Spanish and features full musical orchestration. This made it clear that the cathedral’s new loudspeaker system would require the versatility to not only provide the desired improvement in speech intelligibility, but also provide a powerful music experience for the congregation. 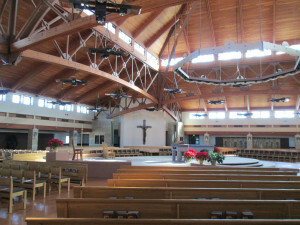 Yost opted to augment the IC Live system with a pair of IC215S subwoofers, installed out of sight behind a grille with the pipe organ speakers.